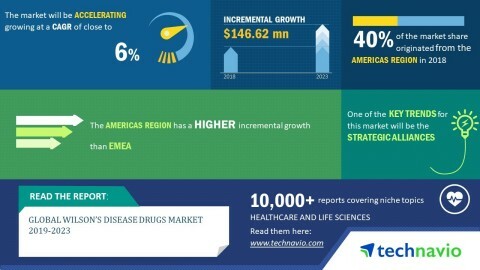 LONDON--(BUSINESS WIRE)-- The global Wilson’s disease drugs market 2019-2023 is expected to post a CAGR of close to 6% during the forecast period, according to the latest market research report by Technavio. A key factor driving the development of the market is the introduction of patient assistance programs. The utilization of prescription medicine for the treatment of Wilson’s disease has turned into an undeniably vital piece of quality medical care. Patient assistance programs have been introduced to help patients who need health insurance or prescription drug coverage to acquire the medications they require. A portion of the patient assistance programs such as New US patient assistance program for CUPRIMINE and Syprine, Patient access network foundation assistance and Teva patient assistant program for GALZIN are trying to decrease the cost load on patients and are relied upon to drive the development of the market. This market research report on the global Wilson’s disease drugs market 2019-2023 also provides an analysis of the most important trends expected to impact the market outlook during the forecast period. Technavio classifies an emerging trend as a major factor that has the potential to significantly impact the market and contribute to its growth or decline. Pharmaceutical companies are engaging in strategic alliances for the development of medications for the treatment of Wilson’s diseases. Such alliances help companies develop new drugs for the treatment of the disease and it also helps in the faster development of therapeutic products. The increase in strategic alliances is expected to support the growth of global Wilson’s disease drug market during the forecast period. “In May 2018, Alexion completed the acquisition of Wilson therapeutics, because of which Alexion added WTX101, a highly innovative drug that is currently in phase III clinical trials for the treatment of Wilson’s disease. Similarly, in May 2016, Ultragenyx pharmaceutical entered into a research, collaboration and license agreement with the University of Pennsylvania.,” says a senior analyst at Technavio. This market research report segments the global Wilson’s disease drugs market by product (chelators and minerals) and geographical regions (APAC, EMEA, and the Americas). The Americas led the market in 2018 with a market share of more than 40%, followed by EMEA and APAC respectively. The dominance of the Americas can be attributed to the introduction of patient assistance programs and special regulatory designations.